One of the company’s product lines includes three-dimensional logo work for businesses. “A customer can provide us with a small example that can fit in the palm of my hand,” Jimmy explains. From there, his team designs and manufactures a large-scale version. 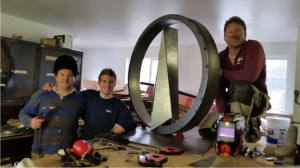 “BobCAD enables us to build the files and assemble the piece in a timely manner.” The picture here shows Jimmy, his son, his brother-in-law, and an example of one of their three-dimensional logo pieces. The part was created with BobCAD-CAM on a plasma table out of 1/8” cold rolled steel. At the end of last year the company was asked to make this sign for a local school. Jimmy says, “We were provided a very complex logo. After discussions with the customer, we decided to make the sign 6” in diameter. The precision required the use of a waterjet. Over the next week, we drew the files in BobCAD-CAM. Everything was nested to maximize material use and reduce job time. 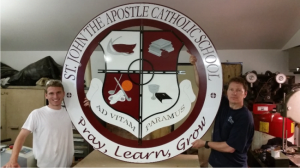 The quality of our files impressed the local waterjet company.” This is a picture of the sign, Jimmy’s son, and a close friend who works at the school. It was made with BobCAD-CAM on a waterjet out of 1/8” aluminum and then powder coated. When examining their shop, you’ll notice they’ve built all over their own machines. 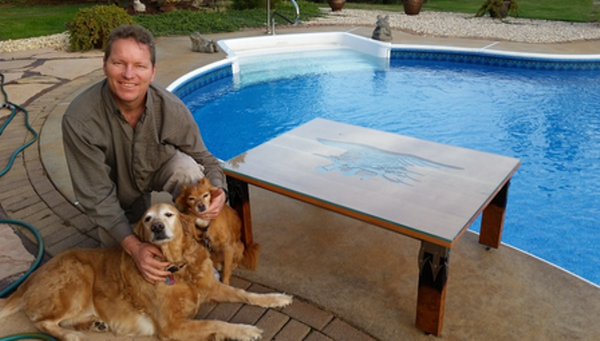 Currently, they have a 5’x8’ CNC plasma table that has a water bed as well as a ball screw wood mill. They run the BobCAD-CAM software every day. 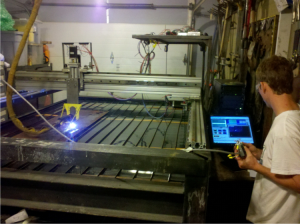 However, prior to using the BobCAD-CAM CNC programming software, things were not always as easy. BobCAD-CAM software completes the bridge from innovation to the CNC machine tool. Features exist to import 2D & 3D CAD files and edit them or use any of the 200+ wireframe, surface or solid modeling functions to fully design parts before even opening CAM. Advanced CAM wizards are designed to remove the guesswork and step the operator through the toolpath and machining process. Thus, streamlining productivity and helping to keep shops moving along with speed and profitability. 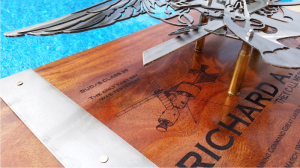 One project that they had completed was this Trident which they made for a retired Navy SEAL who was part of the national space program, specifically the Skylab program. 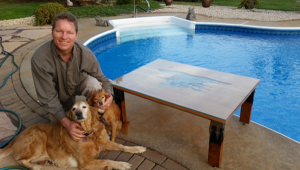 “BobCAD-CAM enabled us to make a fitting piece,” said Jimmy. They created the piece on a plasma table out of 1/8” stainless steel, then clear coated it, and set the piece on mahogany. In addition to the BobCAD-CAM software, the BobART add-on they also use allows them to turn pictures into vectorized 2D geometry that can then be used for machine toolpath or even CAD surfaces or solids. BobART has many other artistic type features for embossing and debossing, working with and creating custom textures, wrapping and so much more. BobART software allows the artist to freely turn their ideas into machine toolpath and real parts easily. Architectural Renaissance Techniques continues to thrive as a custom manufacturing business making unique parts with special meanings behind them. 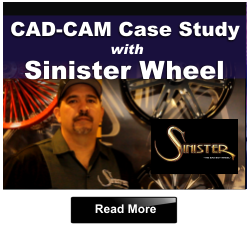 BobCAD-CAM is proud to be a part of their business. 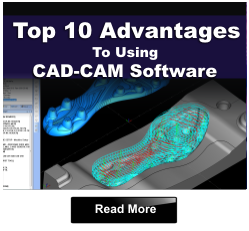 You can also contact BobCAD-CAM directly for more information at 877-262-2231 or 727-442-3554 today! Architectural Renaissance Techniques uses BobCAD-CAM software to make inspirational parts for their customers. Read about it here.